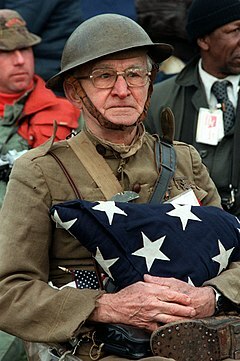 November 11th is both a celebration of America’s Veterans and a commemoration of the Anniversary of the ending of World War I, once called Armistice Day, when the Germans, (the bad guys) formally surrendered to England and France (the good guys) in a railroad car at Compiegne, near Paris, ending the shooting. The Versailles Treaty, in 1919, would finalize the surrender, which while called the War to End All Wars, would only create new hatreds so that 20 years later, most of the same cast had built up enough strength to do it all over again, killing over 60 million that next time around compared to the paltry 17 million lost in World War I.
I’m sure there’s a lesson there somewhere about laying down our lives for a our European friends, as France is filled with crosses where we laid down our lives twice, 1918 and 1944-1945. Only once was it for saving the French, and that was in World War I.
America changed the name of the November 11 commemoration from Armistice Day to Veterans Day in 1954, since by that time and two more wars, the term “armistice” had a hollow ring to it for Americans. And for 64 years now, instead, we celebrate our living Veterans (that’s you) every November 11th, and Memorial Day for all our war dead, which used to be on May 30th. It was also called Decoration Day, so that families could go lay wreaths at the cemetery after church, which was such a poignant sight in rural communities. In 1971 Memorial Day was changed to the last Monday in May so that labor unions, by then mostly then federal workers, could get a paid day off and head to the beach for a 3-day binge instead of going to church and laying wreaths. Those were simpler times, and many of you may not even know they even existed, but I have fond memories of attending a church on Memorial Day Sunday for several years in Kentucky, and sitting in Bachelors Corners commiserating with the old vets. We celebrate Veterans Day here at Veterans Tales every week, for the stories we tell here are a celebration of America’s most exclusive fraternity of brothers and sisters known to mankind. We haven’t even begun to explore the great things veterans can do to save America. But today I want to make a few comments about that first Armistice Day, 1918. The same song Colin Kaepernick refuses to stand for was first played at a sporting event in Boston, in September, 1918, at the opening game of the World Series. It was to honor our troops in France. It then became a standard opening song all over the country, for college, then high school sports as well. It was never proclaimed to be “The National Anthem” by Congress until 1931, which will give you some idea how far ahead of the government the people have always been in knowing what’s good for themselves especially in passing things onto our children. American politicians have not always chosen our wars wisely. My generation will go to its grave debating the wisdom of the government policy that got us into Vietnam in the first place. I still think containing Communism is a good policy, but that sending a bunch of Harvard professors in to plan it wasn’t, and that we should have fought to win it, which we easily could have done, but chose not to, and which cynically cheapened the loss of many thousands of America’s treasure, while emboldening to the dangerous position they and their progeny now hold in our government today. We largely agreed that the Jane Fonda wing of American society were traitors then, and still are today. In other words, I’ll only debate the Vietnam War with people who love America, and not those who never did. Those of you who were in Afghanistan after 911, or Iraq after 2003, will have the same set of arguments facing you in the coming years, about why didn’t Bush do this, or why did Obama do that? Some of those answers are only now becoming visible, since our new president has forced a lot of those players to declare their true intentions, after playing a two-faced game the French turned into an art form centuries before. Today there are gold star mothers out there who hate the military and its mission, all because their son enlisted over her objections, and may have cost her a seat at the weekly coffee klatch in Pomona, then her son went off and got himself killed, so she threw her husband out on top of that. Some people you can’t argue with; some, you don’t even want to get near. But World War I was different. Warfare was different then, and America had never fought in that kind of war before; trench warfare, where wave after wave of men were gunned down for no apparent good purpose. European officers often did things like this out of vanity, a trait I’m thankful American officers never picked up wholesale from our English forbearers. A serious reading of the English side of the American Revolution will reveal the English commanders’ vanity and political differences with their superiors more than made up for our shortages in men and materiel. Arrogance, and bureaucratic indifference in being able to get the right parts for replacement cannon and muskets (much worse than our own Continental Congress, if that’s any consolation) more than compensated for our shortage in gun powder. Then there were the French. Although the French contributed almost nothing to the retaking of France and liberation of Paris in WWII, after D-Day,1944, Mr Nice Guy, Gen Eisenhower, allowed French General Le Clerc the privilege of officially liberating Paris, for which Gen De Gaulle thanked him, then set about claiming Paris had been in fact been liberated by the French all along. Then he demanded a larger role in the final Allied assaults into Germany, so as to be able to be part of the final AMGOT (Allied Military Governments) that would occupy Germany, giving the French their own sector in Berlin and West Germany…at the cost of only American and English lives. For weasel-craft no one could out-do the French. There was a saying going about on the Western Front, in France, in 1917, that “France would defend France to the last drop of English blood.” No really. They said that. True, the French lost 1.15 million soldiers while the English lost 889,000, but not a shot was ever fired on British soil. The Americans were in France barely a year, and in fact did turn the tide for the Allies to hasten the end of the war. But in that one year America lost more men, 53,000, than we lost in Vietnam in over 10 years of battle. American commanders never sent their soldiers in to be butchered the way the Europeans did in World War I. It was not a war in which we belonged, at least socially, since it was a war about alliances between royals, mostly related to one another. It was almost incestuous. Kaiser Wilhelm I, the big cheese of Germany was Queen Victoria’s grandson, for Gods sakes. And they had an officer class that looked upon their soldiers as walking cannon fodder. Only the English put any reliance on their non-commissioned officers, who are still the heart and soul of the American military. The Mountbattens, Prince Philip’s family, were originally German, the Battenbergs, and were the first Tsars of Bulgaria (1877), after it regained its independence from the Ottomans. being also related to Queen Victoria, they moved to England and changed their name. We got into the war because Woodrow Wilson wanted an end to the royal system in Europe, (who didn’t?) but wanted to replace it with a European-style world government, the League of Nations, which was the first blueprint for what we today call the New World Order; government by central bureaucracy. That fight still goes on politically in America today, but in 1918 our military involvement was to have been our calling card to be able to sit at the table of power redesigning Europe after the War. Wilson helped create the League of Nations, then Congress turned him down, but not before 53,000 Americans had died saving France to buy his seat. For a full taste of how that came down, I offer you the story of the Lost Battalion, who was thrown into the Meuse-Argonne offensive just a month before the war ended. It was a mix-and-match unit of 9 companies drawn from three separate battalions, mostly New York City Jews, Poles and Italians, from the 77th Infantry Division, commanded by a MAJ Charles Whittlesey, a New York attorney in the stock market. His unit was to be in the center of a pincer movement against the Germans, only the units that were to be on his flank, one French, one American, never showed up, and suddenly they were surrounded, lost in the forest. Whittlesey was offered several opportunities to surrender, only he refused. Of course, no one knew the war would be over in 30 days. Of 534 men, they had 197 killed, 150 captured or missing. Less than 200 walked out. If you want to watch the 2001 film here, please do. It’s worth your time. World War I ended 39 days later. Maj Whittlesey received the Congressional Medal of Honor, returned to New York and to his law practice but was so popular he was constantly being asked to make speeches and cut ribbons. He was even one of the select pallbearers at the laying of the Tomb of the Unknown soldier. And he stayed in constant contact with the members of his unit. Three years later, he booked a cruise through the Panama Canal, then one night walked out on deck and disappeared. He left a stack of letters to all his friends and family, and it was pieced together that he had been tormented by the fact that had he surrendered instead of staying and fighting and becoming a national hero, 534 men might have ben returned home instead of 179. To honor our veterans and their participation in wars, we need to be reminded as often as necessary that the American military soldier, sailor, airman and marine, and their officers, are unlike any other in the world. Next post Was Arizona a Robbery or a Giveaway?